The Pelargonium "Ashby" is a stunning plant. Large magenta flowers with a dark blotch on the upper petals and scented leaves. 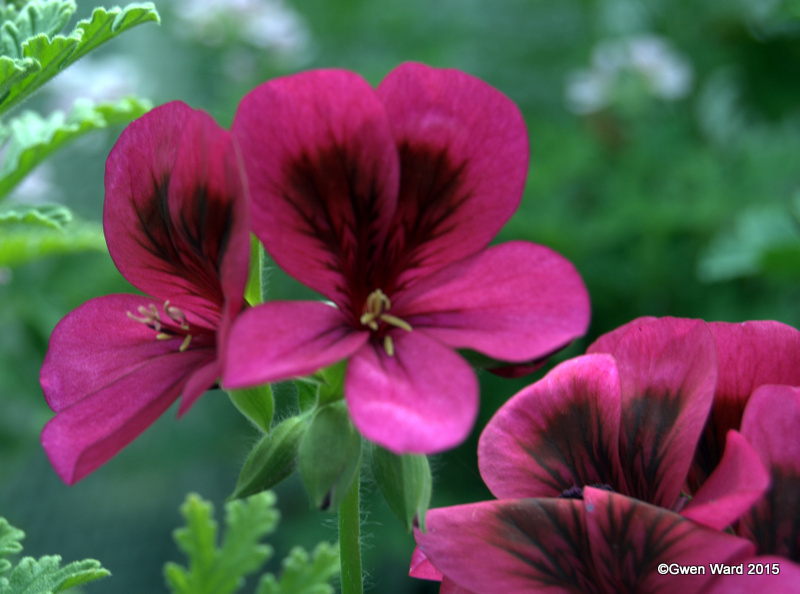 "Ashby" was hybridised by Mrs Popperwell before 2000 and is listed in the Pelargonium Register as a hybrid species. However, several years ago the Pelargonium Judges deemed this to be a Scented, and if shown in any other class to be given NAS (Not as Schedule). The leaves do have a scent - the Register says 'sweet', but I think it is more like cedar. Grown well, this makes a beautiful and large plant in a garden container. There was a very good example by Steve Pollard of how well this can be grown in the Farnborough Show last Saturday - see picture below. So, how did my Club cuttings fare at the show? Sadly, for me, I only got a third for one of the plants, despite both of my plants have many more flowers than the other plants in the club cuttings class. The plant, as I am sure you will have guessed, is Pelargonium grandiflorum - a species. As such it was judged on quality of the plant, and not the flowers. I have to admit, I was rather disappointed, but not much I can do about Judging Rules. The Show was not as well supported as last year, but nevertheless, there was a good display of plants. I did not do too well in other classes. I got two Firsts and a Second for pelargoniums - but they were the only specimens in those classes. I did get a First and a Third for my photographs which I was pleased about. "Ashby" grown by Steve Pollard and shown in the Scented Leaf class.